Ron Quinton Racing :: Daysee Doom proves to strong. Daysee Doom proves to strong. 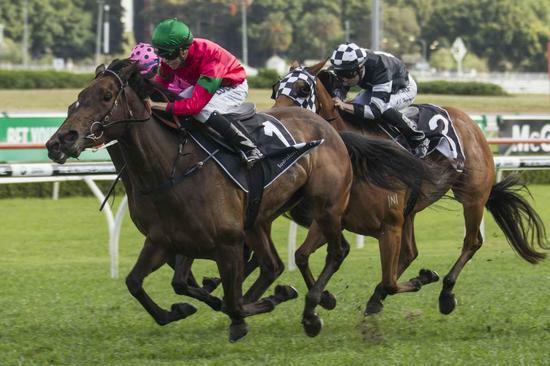 While Sam Clipperton is now in Hong Kong, the sage advice he left behind has helped his former boss Ron Quinton train another winner at Randwick. Clipperton rode Daysee Doom in her first two metropolitan wins last year over 1100m and recommended extending her to 1400m. Quinton heeded that advice at Randwick on Saturday where Daysee Doom won the Alconex Fire Handicap. "I doubted him early but he was right," Quinton said. She has now won four of her six starts and continues to climb in the ratings, making her increasingly hard to place in benchmark races. "It's a good problem to have," Quinton said. Quinton's latest apprentice Andrew Adkins rode Daysee Doom, backed into $3.70 equal favouritsim, as she beat home Countess Marinov ($10) by 1-1/4 lengths with Circular ($5) in third. "She hit the line very, very strong," Adkins said. "I thought she might have been a little bit far for her today but I'll tell you what she's strong and Ron knows what he's doing." Quinton said Daysee Doom would get a shot at a stakes race in her next preparation. "Even in those 1100s she used to look as though she was getting a bit flat-footed and then off she'd go," Quinton said. "That's what she did again today."